Looking for a quality outdoor rear bumper protector that protects with style? Look no further than the BumperBully rear bumper guard. The BumperBully bumper protector is the best quality car bumper protector out there, combining quality materials, functional design and value you added features. Feel the difference in quality: Other car bumper protectors feel like cheap plastic floor mats because they are made from PVC and do not contain rubber. The BumperBully is made using rubber, so it is more durable, flexible and better quality than other car bumper guards. Some value added features include its patented stabilizer bar technology, quality reflectors that will not fade or peel and steel security straps (standard on gold and platinum editions only). The Bumper Bully is a temporary rear bumper protector. Flip it out when you need it. 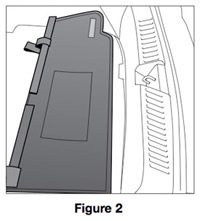 Flip it back inside the trunk before operating/driving the vehicle. Easy Velcro attachment inside trunk. 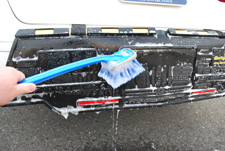 The Bumper Bully bumper guard should be washed regularly, even if you use just use water and a car soft wash brush to clean the surface. 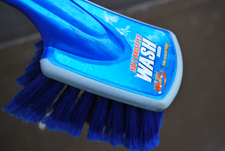 A supersoft car wash brush (~$5 at Walmart) will help you clean the bumper guard quickly and easily. 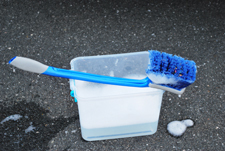 Many car washes will rinse of the product for free or for a small tip (its your responsibility to make sure car wash attendant replaces product into trunk before proceeding through car wash). To prevent damage to your vehicle never pass through a car wash a with bumper guard outside vehicle. (2) Center product on rear bumper and adjust straps. NOTE: * If Velcro does not adhere to the vehicle’s carpet, you can use the additional two velcro stickers provided. 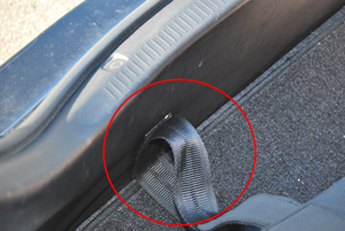 Attach velcro stickers to a clean smooth surface under the trunk carpet or another accessible area; the straps ends can then attach here. 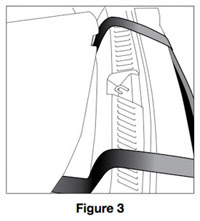 If your vehicle has a spare tire compartment in the trunk, you may drop the straps into the compartment and close the lid (Fig 3). The weight of the lid will keep the straps in place. *** See additional pictures below. OPTIONAL: If the BumperBully blocks your rear license plate you may cut out the center portion using a a razor. 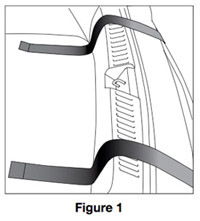 Use the raised edge as a guide. WARNING! FAILURE TO FOLLOW INSTRUCTONS MAY CAUSE SERIOUS INJURY Caution: Never drive a vehicle with product (Bumper Bully) attached. Doing so may be dangerous. Do not block or cover vehicle's exhaust pipe. Covering the exhaust pipe can damage the product and can allow dangerous fumes to enter the vehicle - resulting in injury or death. Not for use with rear engine vehicles. Intended for parking use only. Product was designed to protect the bumpers finish only. Product may not provide protection when impacts are over 1MPH. * Attention - Some states prohibit the covering of license plates while parked. Check with local law enforcement for applicable laws before purchasing. 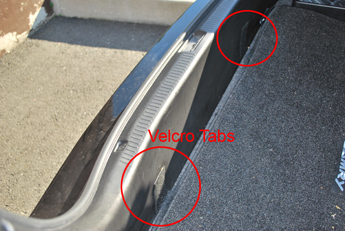 NOTE: If Velcro does not adhere to the vehicle’s carpet, you can use the additional two velcro stickers provided. Attach velcro stickers to a clean smooth surface (i.e. Hard Plastic Surface); the straps ends can then attach.